Sweet potato cookies were the first sensation: Cassandra Thomas, then a young mom in North Rosedale Park, offered her homemade recipe at a block sale. She sold 125 bags by noon. Today, Sweet Potato Sensations operates out of a 4,000-square-foot building on Lahser Road that employs two generations of the Thomas family, plus staff. The store offers an almost-complete sweet potato spectrum, from pies to fries. The multi-layer cake with sour cream frosting won national renown after a crew from the Food Network filmed in the store. Now, the Thomas family — including Charice, 32; Jennifer, 31; and father, Jeffrey — is redesigning labels and reformulating recipes in an effort to get on the shelves of the Detroit Whole Foods market that opens this summer in Midtown. The company is also a target of the Detroit Economic Growth Corp.’s new D2D program linking companies such as Compuware and Henry Ford Health Systems with local Detroit suppliers such as Sweet Potato Sensations. “We’re hoping that Whole Foods can catapult us to the next level,” says Charice Thomas, who — like her sister Jennifer — graduated from college and moved out of state but wound up back in the family business. The family’s struggle to take its franchise of sweet potato sweets to the next level is a uniquely Detroit story of entrepreneurship, corporate outreach — and no easy answers. Marketing to Whole Foods should provide a needed boost — but it’s also costly. The natural foods chain, which met with 76 Detroit food companies last month, has high expectations of its suppliers. For the sweet potato pie makers, that means changing ingredients, reformulating recipes and lab testing the nutritional value of their baked goods. “There are great opportunities for organizations to buy from businesses like Sweet Potato Sensations, and others” says Robert Rossbach, a spokesman for the DEGC. 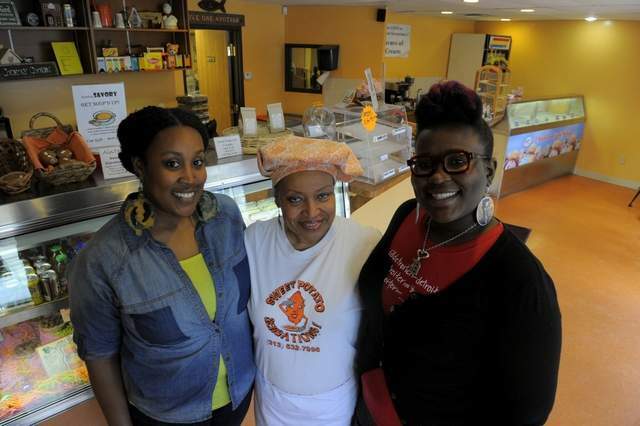 The Thomas family has weathered 25 years of sweet potato pie marketing. Despite a time-tested product, passion for selling and a new generation eager to master marketing problems, they can’t afford missteps. “We have some challenges,” says Cassandra Thomas, 59, with a sigh. Once a buyer for Hudson’s, the company’s founder worries most about her retail location in a long-declining area, and drug traffic in the neighborhood. The store is kitty-corner from the Redford Theatre, on a block with a coffee house and an art studio, all bright and newly-renovated. But the surrounding blight can feel overwhelming: “We’re trying everything from farmers markets to wholesale and maybe to pop-up stores,” says Charice Thomas. The DEGC program may help. Cassandra Thomas won weekly business coaching sessions through “Count me in Detroit.” Husband Jeffrey, who works for an automotive supplier, enrolled in a Small Business Administration program to help strategize. TechTown is involved, too, using Sweet Potato Sensations as a case study for business students. Charice Thomas sees Whole Foods — which is committed to using local suppliers — as a potential breakthrough. She’s got Michigan State University working on the nutritional breakdown. She’s redesigning labels, sourcing eggs from cage-free chickens and finding untreated nutmeg. “It’s a lot of work but it’s going to be good,” she says.